Taking the zombie genre to the Qing dynasty, from the makers of Train To Busan, Rampant comes to digital and blu-ray soon. Yes, it’s the film you wished you’d thought of, never realised you wanted or needed, but here it is anyway. 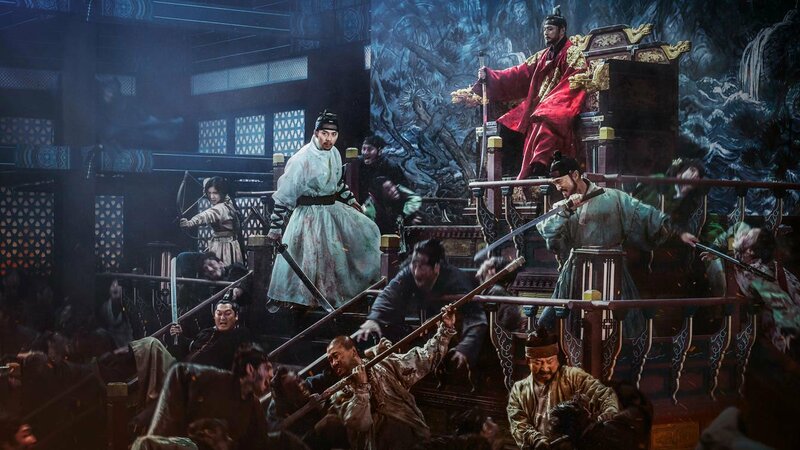 From the makers of Train To Busan, the South Koreans have added zombies to the mix of swords and dynasties and, well, why not? For starters, let’s look at why you should: We have had some great zombie films, mixed in with things that you wouldn’t expect, who can forget Pride And Prejudice And Zombies for instance or the aforementioned Train To Busan? So, take a traditional Qing dynasty movie, with backstabbing (literally and figuratively), sword-play, kings, princes and princesses. Then add a whole heap of zombies, or demons as they’re called here. Rampant should have been the dynasty-zombie movie we have all been waiting for. Why then, does it not reach the giddy heights we oh so hoped for? Well, the runtime is the first reason. Much like the other South Korean film Burning, that we reviewed recently, Rampant is far too long at two hours and nine minutes. Then there’s the storyline. Rampant has a core story of a prince, Hyun Bin (“Secret Garden (TV)”, “The Fatal Encounter”), who returns to his home-town, with his sidekick, Man-sik Jeong (“The Yellow Sea”, “Midnight FM”), after the death of his brother. What he discovers is not good, not good at all. It transpires that the area around his home-town has been overrun by demons (zombies) and his father, Eui-sung Kim (“Train To Busan“, “Mr. Sunshine”), instead of riding to their rescue, has instead cut the town off, leaving them to die at the behest of Dong-Gun Jang (“The Warrior’s Way”, “Brotherhood”), his minister of war, or should that be sinister of war (no, it shouldn’t). The prince and his sidekick, who appears to have been added purely for some light, occasional, comedic relief, meet a bunch of warriors who have thus far survived, and heads to the kingdom to gather the army. Instead, what he meets is nothing but hostility, a set of minister who don’t want him, or his father, at the helm any longer and, to top it all, the demon-plague is spreading and has escaped out of the local town and into the city. This convoluted story, mixed together with the occasional horde-zombie attack, means Rampant comes across as a confused film, lurching from serious, families at war, dynasty movie to rampant zombie movie with seconds of light-hearted comedy brought to you by Man-sik Jeong thrown into the mix. Rampant looks good, it’s well directed, the action is good, the acting is good, but Train To Busan this is not, not by a long way. It doesn’t capture the rawness of TTB, the brutality of it. Instead we have a good-guy who can defeat hordes of anyone with barely a scratch and a bad guy who can do the same and can also manage to stop himself turning into a zombie, instead turning into some kind of zombie-powered bad-guy. I know, right? Rampant is eye-roll tastic, particularly as we hit the frantic last-half hour. It’s also full of souring music and many, many people willing to sacrifice themselves for the sake of the greater good. Frankly, it can get a tad tedious and it’s all a bit OTT for what is, essentially, a zombie film. Serious or not? You decide, for the makers couldn’t.